Charming pet friendly vacation rental home with private pool and hot tub close to Bull Shoals Lake. 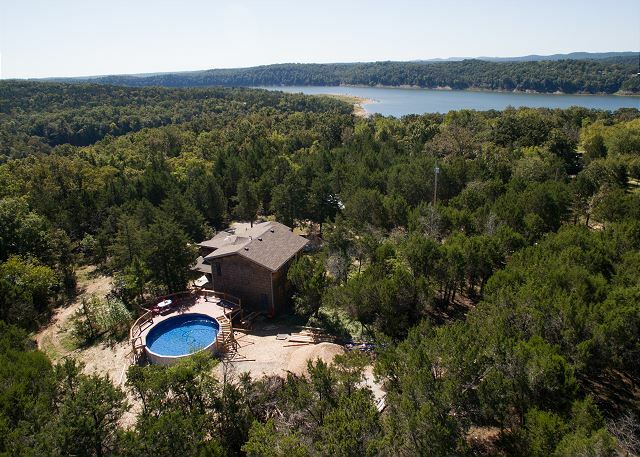 If you want a place to relax in the Ozarks and spend time with the family, your search is over. This country home in the woods may look rustic at first glance, but inside you'll find all the modern conveniences you could ask for. Granite counters in the kitchen, flat screen televisions in the living area and bedrooms, and wi-fi to stay connected and update friends on your amazing Branson vacation. With everything this charming vacation rental home has to offer, including a private pool in the backyard, a private hot tub, and a cozy fire pit (with firewood included! ), the kids may not want to leave the house! You can bring the entire family too, including your furry best friend: this property is pet friendly! But, there's plenty to do nearby: less than a mile down the road is a swimming beach where you can splash around in Bull Shoals Lake or launch your canoes and kayaks for a leisurely paddle around the lake. If you prefer a motor on your boat, bring your lake toy with you. K-Dock Marina is only 15 minutes away where you can rent a boat slip. You can also rent pontoons and fishing boats if you want to catch your dinner as Bull Shoals is famous for bass fishing. After you've grilled your fresh catch on the propane grill in the back yard and want to take in the Branson shows and attractions, you're just a 15 minute drive away. Henry loves his hideaway and you will too! The house is located near the end of a country road. It's a beautiful house in a beautiful location that feels very private. Accommodations were great. The hot tub was a nice way to start or end the day. The internet was slow and AT&T cell phone reception was spotty, but it was all worth it because the property was so great, and just 20 minutes from Branson. It was nice to get out of town at the end of a busy day. Thanks for letting us vacation in your home! We enjoyed our time at Henry's Hideaway! We found plenty to do and the location was great. We loved the pool and hot tub. Henry's had all the comforts of home. This was a beautiful and very clean house. The kids swam all day long. The pool is very big and well maintained. My husband who went fishing every morning wishes it had been easier to launch his boat right down the road but the water levels were really high. Also, a little bit a further of a ride to Branson than we anticipated but that didn't stop us from going into town. The neighbors were friendly and invited us to a party on the 4th of July. I would definitely recommend this rental property. We had a great time, even with the very cold temperatures on our "New Year's family get-a-way trip." We will love to rent it again, maybe on summer time next time; it would be awesome to be able to use the pool.The property description and pictures are accurate; it's well maintain and clean. The reviews of other customer really help. With the weather conditions it did get a little hot on the second floor for some of our family members, but there is plenty of space downstairs to sleep... so the next night that what happened. The house was clean and very nicely decorated. The beds were comfy and we didn’t have any trouble with 6 people showering. The kitchen was great for when we opted to eat in, and the table was roomy enough for everyone. We saw deer in the yard and enjoyed the quiet out of town feel. One odd thing was there were tons of light switches, double switches hat seemed to go to nothing in some places, maybe labels would help. The first day it was very cool down stairs and very warm upstairs, too warm for some to sleep well. I eventually emailed inquiring were there 2 thermostats, but didn’t get a reply. The next day, while it was still cool downstairs, it was very nice upstairs. By the end of the stay it seemed to all level out. That makes me think maybe the heat hadn’t been turned on in an adequate timeframe. Otherwise it was a very nice place and would probably stay there again. The rental is just like the pictures. Very nice and clean. Not far from the lake, quiet area, and deer come to visit everyday. The pool was one of our favorite places to hang out (nice). About 20 min. from Branson Landing and Hollister for shopping and restaurants. The house has a great layout inside and outside so you are not tripping over each other. Lots of nice cozy spots to talk, read and relax. Good morning, Roger. Thank you for your glowing review! We're so glad to see that you enjoyed your time at Henry's Hideaway, and we can't wait to have to back for another visit. The deer will be happy to see you again too! :^) Don't forget to mention your previous stay for a returning guest discount on your next Branson vacation! We reserved this out of the way house for a couples retreat for 3 couples. The location and accomodations were perfect for our stay. Having the pool was an additional amenity. We traveled with our 3 small children for vacation. The pool was the Best feature for us because it kept the children entertained. We were glad the water was only about 4 ft deep. The house was very clean and spacious, which was ideal for our family of 5. We loved the spacious kitchen and the family styled dining table. I suggest stopping for groceries prior to arriving to the house and don't forget MOSQUITO REPELLENT. This home is located in a wooded area so bugs are expected. We didn't see One bug inside the home, which was very impressive. We would definitely stay here again! Hi, James! Wow, what an impressive review, thank you so much for taking the time to write it. We're so glad that you had an excellent stay at Henry's Hideaway, and we'd love to see you again in the future! Don't forget to mention your previous stay with us for a special returning guest discount! This property was perfect for our family vacation that included our daughter, 2 grandsons and their wives and our 9 year-old Great Granddaughter and 9 month-old Great Grandson. The rooms in the house were spacious and accommodating. We enjoyed the pool as an additional gathering area as well as swimming. It was secluded, but close enough to tons of activities in Branson. Henry's Hideaway was amazing! It was exactly as described and we had no issues whatsoever. We liked the privacy it offered yet we were only about 20 minutes from Branson. The kids loved the pool and we will definitely be thinking of Henry's Hideaway for our vacation next year. Hi, Paula! Wow, we're so happy that you enjoyed your stay that much! We'd love to see you again next year, so please don't hesitate to call when ready. You'll even have a special returning guest discount waiting for you. Thank you for your review! The cabin was just as described. Very well kept. The area was peaceful and very close to the lake. Our children loved the pool. We will stay here again next time we are in Branson. Hi, Michelle! Thank you so much for your review. We're so glad to hear you enjoyed Henry's Hideaway, and we can't wait to see you again! Don't forget to tell us about your previous stay for a returning guest discount on your next Ozarks vacation. Amazing, fantastic, memories made for a lifetime. We loved this getaway, we shared it with a couple other families and everyone had a wonderful time. The home is cozy, new, updated interior. We will definitely be back! Hello, Nick. We're so glad you enjoyed the stay at Henry's Hideaway! We can't wait to see you again, and be sure to mention your previous stay with us for a returning guest discount. Thank you so much for your review!